Each control in WPF has a Tooltip property that can be accessed through XAML or code behind. 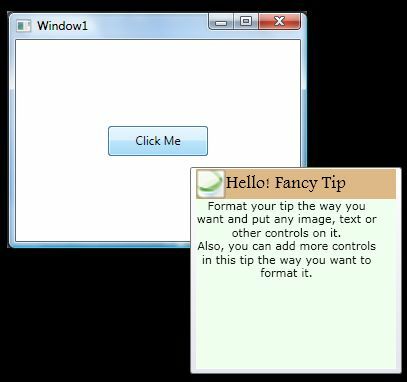 This article shows how to create a fancy tooltip in XAML and WPF. Each control in WPF has a Tooltip property that can be accessed through XAML or code behind. The Tooltip property can host any kind of controls such as a rectangle, text block, or a panel. In other words, we can display another window with any number of controls as a tooltip of a control. can click me if you want but I will do nothing for you. As I said earlier, a Tooltip can host any number of controls. For example, in the below code, a button tooltip hosts a StackPanel with two children StackPanels. First StackPanel hosts an image and a text block and second StackPanel hosts a larger textblock. The output looks like Figure 2, which is a fancy tooltip. <Run FontFamily="Verdana" FontSize="11" FontWeight="Normal" Foreground="#FF151514"
Text="Format your tip the way you want and put any image, text or other controls on it. Using this approach, you may design your tooltips the way you want. Note: In the above code, you may want to change the source of the image file by changing the following code: Source="C:\Projects\XAML\FancyTooltip\FancyTooltip\samp.png"